I have a really bad habit of letting food go to waste. I know it's a terrible thing to do, and I feel guilty every single time I throw away uneaten food that has gone bad in the refrigerator. I'm trying very hard to mend my ways, but sometimes it just isn't easy. The other night, I had half a can of whole-berry cranberry sauce in the fridge. I had tried to use half of it in a recipe that failed miserably (not the recipe's fault--we had an ingredient go bad and didn't realized until it was too late in the process. We ended up eating grilled cheese for dinner that night.). So, there sat half a can of cranberry sauce. To be completely honest, the jelled consistency of the stuff grosses me out. But, keeping in mind that I have been trying so hard not to throw food away, I started looking for a recipe to use it up. There is a new-ish website out there called Eat Your Books. I signed up for a lifetime membership back in May. Basically, they index cookbooks. You create a bookshelf with the cookbooks you own, and viola--you have a searchable database of the recipes on your cookbook shelves. Right now, only about 50% of my cookbooks are indexed. That's still a lot of recipes to search from--according to the website, when I log in, exactly 22.465 recipes, to be exact. I performed such a search and found the perfect recipe to use up the cranberry sauce. As a bonus, it would also use the juice of the orange that was sitting in fridge, divested of its zest. The recipe was for Orange Cranberry Muffins from Alton Brown's I'm Just Here for More Food. So, I quickly mixed together the streusel topping, whipped up the muffin batter, scooped them out, sprinkled the topping on as well as I could (the muffin cups were over-full, so it was hard to make the streusel stick), and popped them in the oven in time to sit down and watch an episode of The Big Bang Theory on DVD. While I watched the hilarious antics of the ever-endearing nerds, my house started to smell ridiculously good. The kind of good that makes your stomach rumble and your mouth water, even though you just ate dinner an hour ago. These muffins were a wonderful solution to my cranberry sauce problem. As a matter of fact, they were such a good solution that they have created their own problem. When I make them next, what will I do with the other half of the can of cranberry sauce? I guess that just remains to be seen. 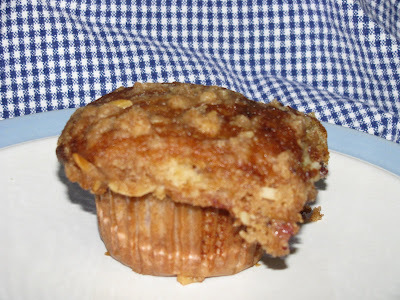 In the meantime, I would strongly urge you to make these muffins when you get the chance. They have the perfect fall/harvest taste. 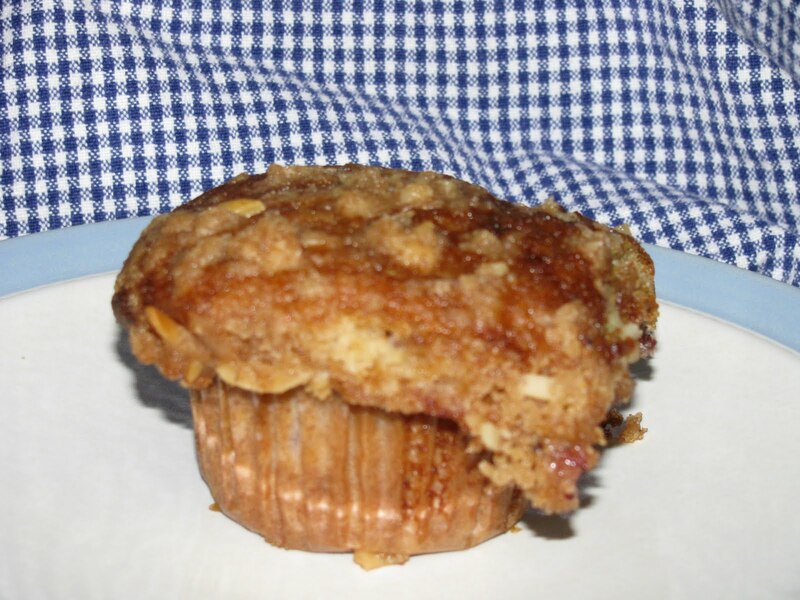 They are tender, and buttery, with a subtle crunch from the streusel topping. And, every now and then, if you are lucky, you bite into one of the whole cranberries, which gives you a joyful tart pop on the palate. 1. Mix streusel ingredients until cohesive, but still crumbly. 2. Preheat oven to 350, and grease a muffin tin. 3. Combine the dry ingredients in a bowl. 4. Cream together the butter and sugar. 5. Add the eggs and mix until combined. 7. Scoop the batter into 12 muffin cups. The book says to fill them to the top. Mine crested over the top. They still turned out great. 8. Sprinkle with streusel topping. 9. 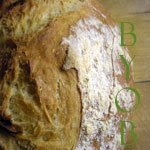 Bake for 30 to 35 minutes, until a tester comes out clean. 10. Allow muffins to cool before taking out of the tins. Great way to put things to use. I love it!